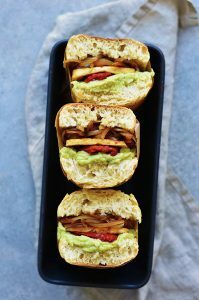 This hearty vegan sandwich is filled with fried tofu slices, fried onion and a silky avocado cream and served warm. This might be your new favourite friday dinner. Cut the tofu block in half and then slice each half into 4 thin slices. Fry in a non-stick pan until golden brown on both sides. At the same time, heat up another non-stick pan and fry the onions until golden brown. Add a pinch of salt. Once the tofu is golden brown, brush each slice with some soy sauce and let them on the pan for another minute on each side (but turn of the heat). If you want to eat your sandwich warm (which I recommend, Y-U-M), preheat oven to 180ºC. Cut the french baguette in two halves and slice them open. Spread each slice with around 2 tablespoons of the avocado dip. Assemble the sandwiches by adding the onions, the tofu and the dried tomatoes. Place the sandwiches on a baking sheet and bake for 5 minutes at 180ºC.